- Publisher Here's good news, if you're a woman approaching ages 45. It's an exciting, unsettling, and wonderful time to be a woman_and a time that fills us with questions. What does it mean to follow Christ as a woman of 45, 55, or 65? Does God still have meaningful work for me to do? How do I serve Him with all my heart, soul, and strength, when my heart, soul, and strength, are so different from what they were in my youth? What kind of faith do I need for the second half of my life? As adolescent women, we faced a number of life changing transitions: separation from our parents, discovering our own identity, coping with changes in our bodies, considering a world of new opportunities, and deciding what to do with our lives. As "middlescent" women in our forties and fifties, we face transitions that are strangely similar_and every bit as disconcerting; separation from our children, rediscovering our identities, unwelcome changes in our bodies, and opportunities that were never available to us before. Suddenly, we find ourselves wondering: What will I do with the rest of my life? - Publisher We turn 40 and say we've gone "over the hill". Brenda Poinsett shatters the myths of what it means to be a middle-aged woman. Addressing the challenges of what she calls "middlessence", Poinsett invites women to embrace life after 40 and discover God's exciting new direction for the rest of their life. Brenda bases this book on her survey of hundreds of Christian women from the United states and Germany. But this isn't just a book of research -- Brenda shares inspiring stories of real women that readers can relate to. Brenda also tells how she came to write this book and her own struggle to see the years after 40 as the best years of her life. This life-changing book includes a discussion guide for small group use. About "What Will I Do With the Rest of My Life"
Here's good news, if you're a woman approaching ages 45. It's an exciting, unsettling, and wonderful time to be a woman_and a time that fills us with questions. What does it mean to follow Christ as a woman of 45, 55, or 65? Does God still have meaningful work for me to do? How do I serve Him with all my heart, soul, and strength, when my heart, soul, and strength, are so different from what they were in my youth? What kind of faith do I need for the second half of my life? As adolescent women, we faced a number of life changing transitions: separation from our parents, discovering our own identity, coping with changes in our bodies, considering a world of new opportunities, and deciding what to do with our lives. As "middlescent" women in our forties and fifties, we face transitions that are strangely similar_and every bit as disconcerting; separation from our children, rediscovering our identities, unwelcome changes in our bodies, and opportunities that were never available to us before. Suddenly, we find ourselves wondering: What will I do with the rest of my life? We turn 40 and say we've gone "over the hill". Brenda Poinsett shatters the myths of what it means to be a middle-aged woman. Addressing the challenges of what she calls "middlessence", Poinsett invites women to embrace life after 40 and discover God's exciting new direction for the rest of their life. Brenda bases this book on her survey of hundreds of Christian women from the United states and Germany. But this isn't just a book of research -- Brenda shares inspiring stories of real women that readers can relate to. 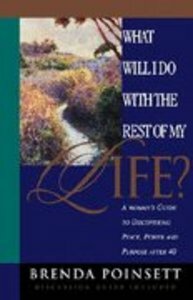 Brenda also tells how she came to write this book and her own struggle to see the years after 40 as the best years of her life. This life-changing book includes a discussion guide for small group use.